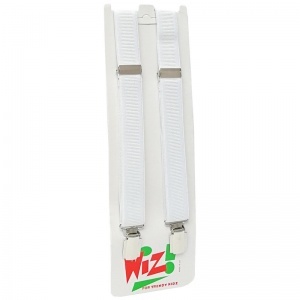 Add a jazzy touch to your boy's formal outfit with these plain white elasticated braces. These braces are adjustable with nickel free silver metal clasps. Suitable for any special occasion including a wedding or party, to compliment his suit. Perfect little braces. Look good/smart and a great price too; exactly what I was looking for so in all I got 3 different colours! I was very happy with these braces, as was my 3 year old son. He wore them without complaint and found them very comfortable. Wouldn't hesitate to purchase again.